Hortus Camdenensis | Erica viscaria L.
Heath with linear leaves in whorls of 4 and drooping racemes of purplish-red flowers. To 60cm. [LBC no.726/1823]. ‘It is a pleasing sort, of which there are several varieties. Their flowering time is in the spring months, and the blossoms last for a considerable while.’ [LBC no.726/1823]. Introduced to Europe in 1774. [Don]. Listed in the 1843, 1845 and 1850 catalogues. See Erica nudiflora L. and Erica bauera Andr. Marked as grown at Camden in the 1836 Loddiges’ catalogue held at Camden Park [CPA] and probably obtained from Loddiges’ nursery. Erica viscaria Bory ex Benth. (1838) = Philippia viscosa Benth. 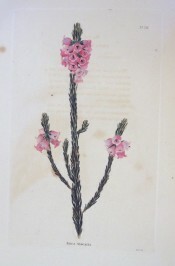 Erica viscaria F.A.Bauer (1796) = Erica decora Andr.